We were told to catch a salmon for ceviche. My friend Brent Taylor and I walked up the Patagonian river he’d been fishing and guiding on for 15 years. I clambered on the cobbles, but he kept to the shin-deep swift current. After a few minutes, I figured it out. Brent turned and smiled: Not really. We’d driven a long dirt-road hour from his base town of Coyhaique to reach this steeply pitched canyon water, its jewel-blue flow. We’d opened and closed four cattle gates and glad-handed the gaucho who owned the land with a six-pack of cerveza and a large chocolate bar. In Spanish, he told Brent: Nobody’s been fishing since you came here last year. And yet: nonpareil stealth. A flock of iridescent green birds flew over us and banked downstream. “What kind of birds were those?” I asked. 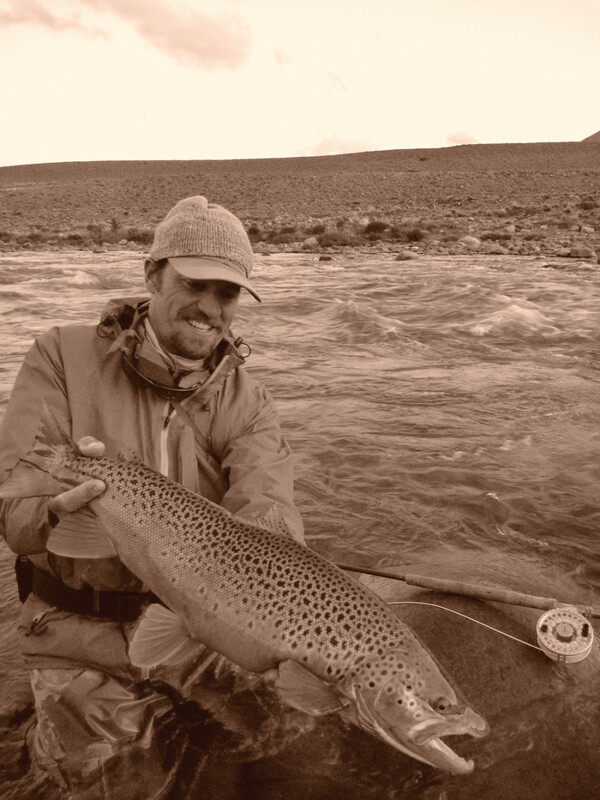 Brent with a nice brown on a remote Patagonia river. A few minutes later we were crouched on all fours at the top of the cliff, peering down through rose-hip branches at a swirling mass of ocean-goers. Huge fish. Even 20 feet below the surface they seemed big. Not soon, one of the estimated two dozen levitated briefly, and its pale gold sides flashed. “That one looks 40 pounds,” I said. I first met Brent Taylor 17 years ago in Dillon, Montana. Rookie trout guides rowing for the same lodge, we were as green as the Volkswagen bus Brent lived out of, but the fish in the Beaverhead and Big Hole rivers cooperated sufficiently enough to keep us in the tip money. For most of the summer we remained collegial acquaintances, until one night after a long day of repetitive rigging, untangling and rerigging we stood in the lodge parking lot, leaning against our drift boats, the August sun slipping over the mountains. “My dudes were brutal today,” I said. I looked east toward the Tobacco Root range over which the waxing moon was soon to rise. We both had to work early the next morning, still had to clean boats, tie flies, gas rigs. If we launched at 10 p.m. we could be off by 2 in the morning, run the shuttle and make it home for a four-hour nap. “I’m in,” I said, shaking hands with one of the few anglers I’d met whose angling mettle exceeded my own. That night, while swinging greased deer-hair gurglers across the moonlit Beaverhead tailouts, I learned the partial extent of this mettle. Brent had discovered Dillon and its fisheries, he told me, not via guidebook or kiss-and-tell article but via bicycle! On a two-wheeled cross-country fishing trip! His second in two years! The first took him from Maine to San Diego, the second from Miami to the Washington coast. 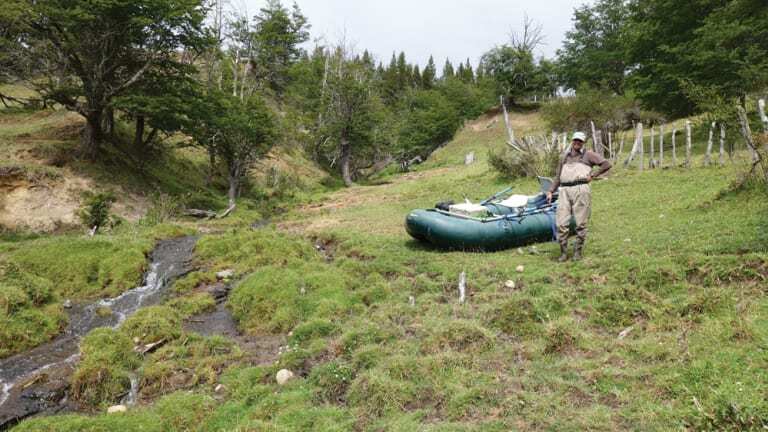 These days, a typical fishing year finds Brent in southern Chile by January, where he guides until mid-April for large brown and rainbow trout on desert spring creeks, glacial-fed lakes and freestones. 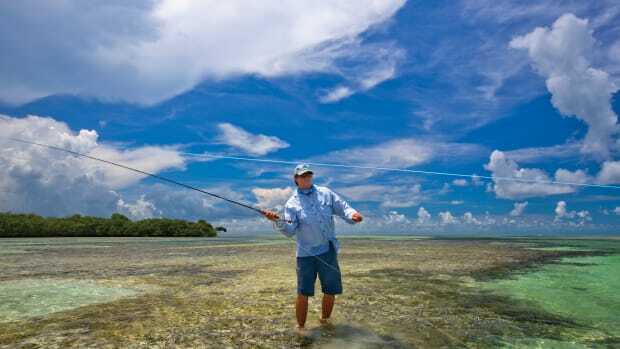 After his clients head north, he makes for the Florida Keys, where a friend’s skiff waits at his disposal; here he wields the tarpon-stick on migrating silver kings until his tip money from Chile vanishes like a gill-red sun over the Marquesas. Then it’s back to Dillon to guide through mid-September. Following a brief hiatus to hunt upland birds behind his beloved Llewellyn setters, Brent lights out for British Columbia, where he ends his year swinging soft-hackles for some of the largest steelhead on the globe, often putting 100 of these creatures on the bank before heading south. 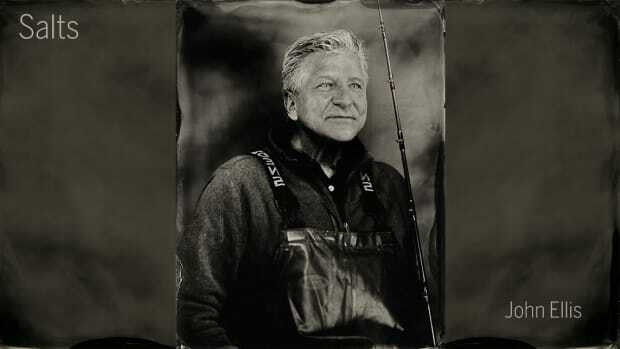 In addition to being an accomplished artist and photographer, Brent is a world-class fly-tyer and designer. His casting prowess (ever seen a 2-weight cast to the backing?) and boat-rowing skills (he’ll take his drifter down deer-leapable channels if it means getting his clients a good trout) have become the stuff of myth in southwest Montana, but fame is not something Brent desires. 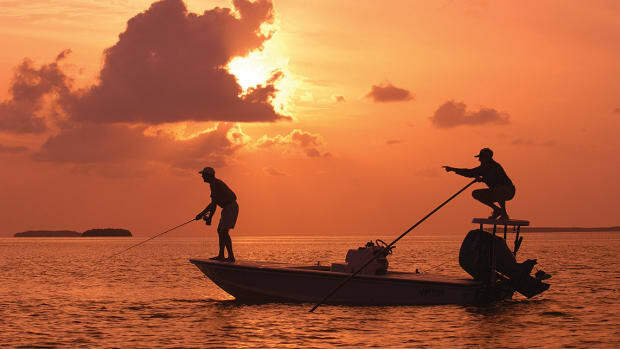 An angler with time for fame, after all, is an angler with less time to fish. 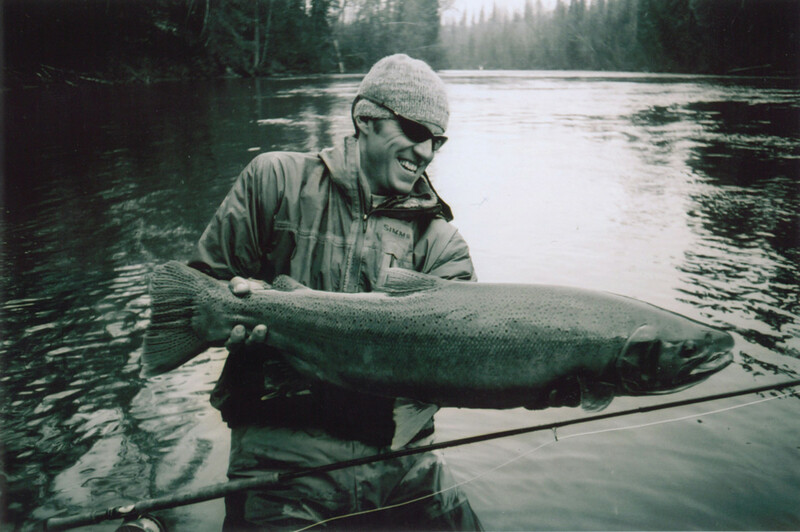 Once, in our early guiding years (pre-cellphone), he called me in the middle of the night to see if I’d come take a picture of him holding a 30-inch rainbow he’d caught on a dry fly. “Where are you calling from,” I asked. “The pay phone at the rest stop,” he said. He’d told me where he caught the fish, and I calculated the rest stop a good 15 minutes from said honey hole. I asked why his girlfriend couldn’t come take the picture. Brent even met his wife, Jen, on the river, a few years ago on the Gallatin. 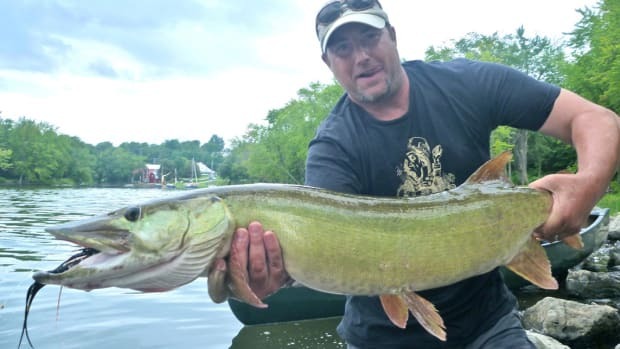 While launching his drift boat one early August morning with a longtime client, Brent saw, like a vision of one of Izaak Walton’s dairymaids, “this beautiful girl” coming up the bank with fly rod in hand, and he asked how the fishing was. “Good,” the lean, long young woman said. “Hoppers,” she said, with a shrug. “Tan Fat Albert.” A chubby, leggy concoction, the Taylor’s Fat Albert is one of the most popular Western trout flies and, coincidentally, a bug that Brent designed for Montana Fly Co., the worldwide fly merchant. 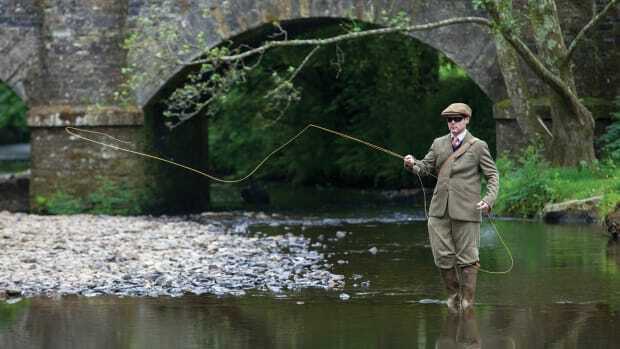 Assuming this as-yet semistrange man meant that he really liked Fat Alberts, employing their services often while fishing, the young woman smiled politely and said, “Awesome,” then made her way up the curve of the river looking, to the man downstream, longer and leaner with every step. Moments later, a bit chagrined, Brent pulled up anchor and began to drift downstream with his client, Mel. Hustling upstream, high-stepping the sage and deadfalls, Brent searched two bends but couldn’t spot her. She’s a savvy angler, he thought, not wasting her time on the boat-ramp pools. He considered continuing but thought of his paying client in the boat, the morning’s brown-trout-holding shadows already beginning to wane. 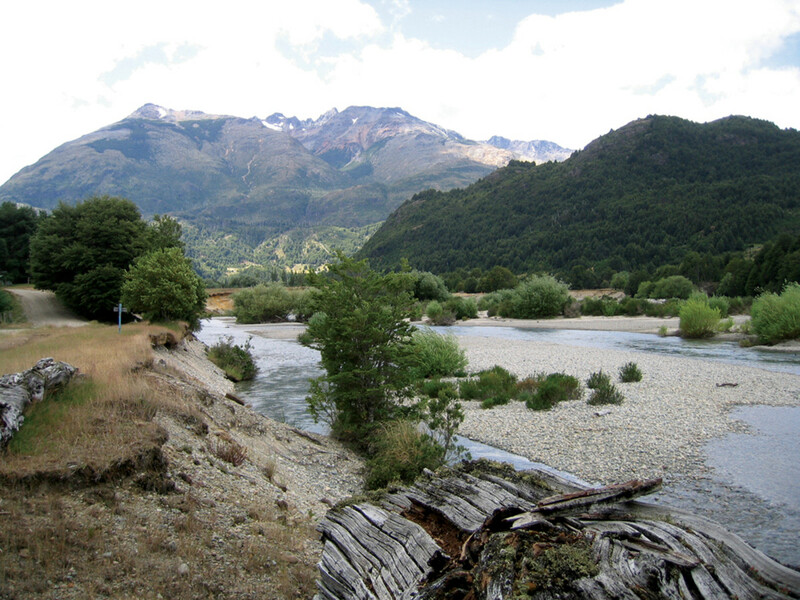 The Patagonia countryside is still a place where you can find plenty of elbowroom and quality fishing. He debated: the red pickup or the Subaru, the Subaru or the red pickup? 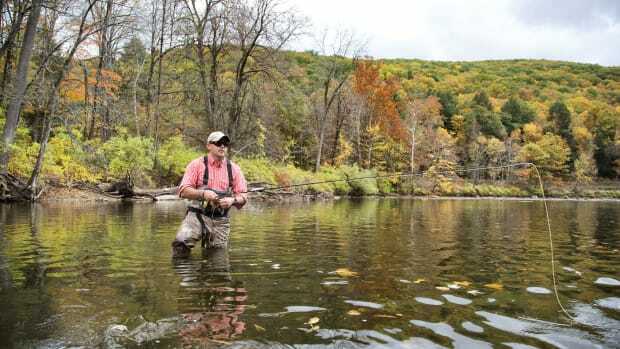 It felt like floating downstream and passing two promising trout lies, one on each side of the boat, only one of which can be chanced. The red pickup it would be. He lifted a windshield wiper and placed the box of flies beneath it. Two weeks later, his telephone rang. As we made our way back across the Chilean river, I asked Brent if he recalled our first night-fishing excursion back on the Beaverhead nearly two decades prior. Now, severely undergunned for salmon, we rigged 6- and 7-weight rods with 12-foot leaders tapered to mere 8-pound Maxima. To the end of our leaders we tied an articulated purple egg-sucking leech pattern that Brent had had luck with in the past. “You got split shot?” I asked. A classic Brent response; I wasn’t going to bite. 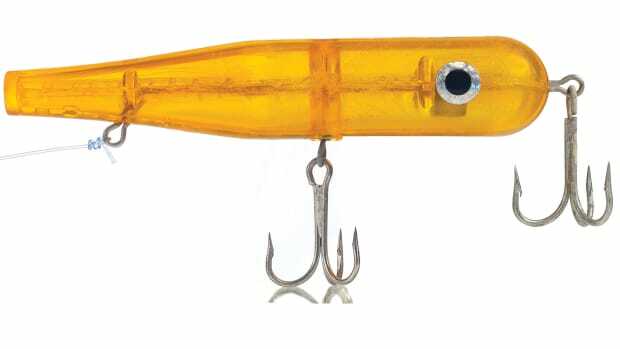 As such, taking turns with the 7-weight, we had to be nearly perfect with our back casts: Dropped back-cast could mean a weakened tippet, which could result in a lost sinker and a dinnerless excursion. We fished for an hour without a tug. 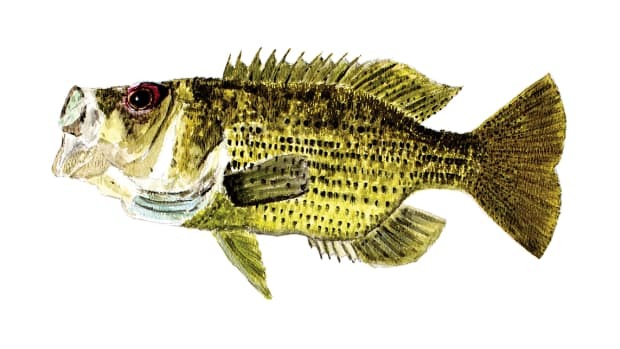 Now and then, a fish would appear to rise up from its schoolmates to investigate our fly because the mass would flash, stir and resettle, but we never had a touch. With a triple surgeon’s knot, Brent added 2 feet of tippet to the leader. 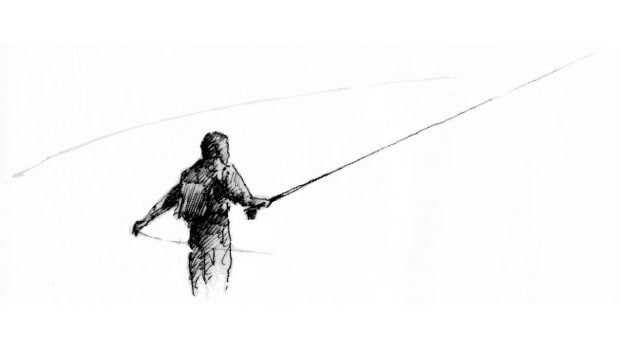 “Either that or the light will get lower and the fish will come up in the column,” I said, but Brent had no time to respond: His rod lurched and the line came tight momentarily before zig-zagging frantically across the pool. Then, after a chaotic line-clearing moment, the fish hunkered and burrowed back into the depths. Two seconds later, the fish came unbuttoned. I sank into the bank, deflated. “You’re up,” Brent said, handing me the rod. Over the next three hours we would hook three more fish: one 50-pounder that charged the surface and struck as I was picking up to recast, stayed hooked for a mere moment before, tail-walking, it littered the surface of the water with spray; one very heavy fish I never saw but fought for 20 minutes before the hook simply came out; and one 50-plus-pounder that Brent hooked on the last cast of the day. 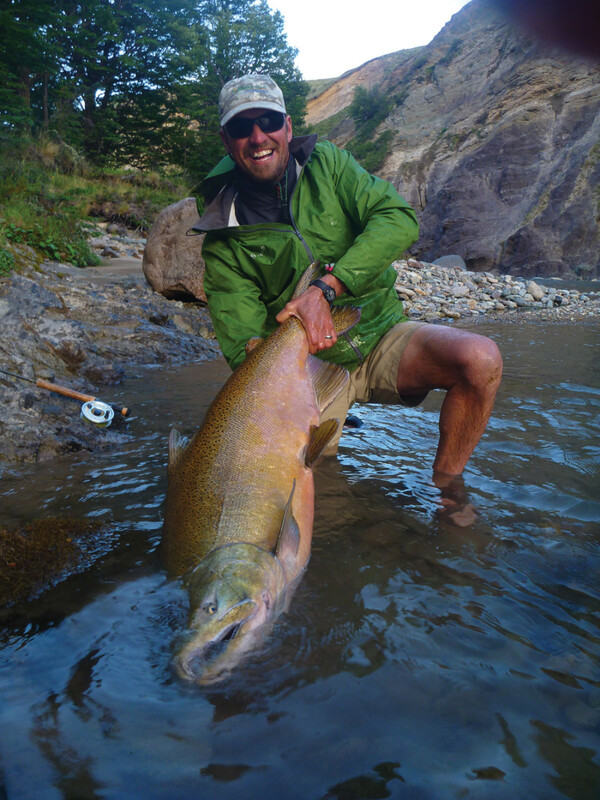 End of the year finds a peripatetic Brent Taylor (patagoniaangler@hotmail.com) fishing for steelhead in British Columbia. The sun had fallen over the canyon rim, and just the highest rock precipice held a copper-colored light. We’d been gone more than four hours and were nearly resigned to returning to the truck and our wives without a salmon to eat. Before quitting, though, Brent suggested we should each cast our lucky number’s worth of casts. I cast 19 times: nothing. Brent cast 16 times: nary a grab. I went for the horse collar, and Brent’s first three casts swept through the run unmolested. But his final cast — way down at the bottom of the swing, and I embellish none of this — was intercepted by a male as thick as a bank-safe door. Thirty minutes later, the fish was wallowing in the shallows directly beneath the cliff we’d perched on several hundred minutes earlier. “I think I can tail it,” I said. When I had finally gripped its tail with both hands, the fish kicked like a 35-horse Mercury, throttle open and free of its mountings. I rode out the throes and steered the big male toward the shallows, where Brent further corralled it. Staring up at us, its eye was the size of a silver dollar. “I think we should let it go,” Brent said. “What? !” I said, and reminded Brent that our wives had been waiting patiently for more than five hours and that the only possible gesture of redemption on our behalf would be to deliver this fish heroically to the truck; and that, in fact, I could already taste it: ceviched chunks of it floating in vinegar, lime, onions and cilantro, maybe even a steak of it grilled with onions and garlic. I bit my cheek, my heavily salivating cheek. It was Brent’s river, his call, and I know him well enough to know he had likely earlier brokered a deal with the unreachable-to-mere-mortals-such-as-myself fish gods, requiring the release of this fish; that he revered the magic of hooking this fish on the last of last casts more than he valued any reward he might receive on the home front. And yet, we couldn’t lie to our wives and tell them we’d been skunked: We’d have to show them the few pictures we’d already taken. It was madness, I thought, as Brent unhooked the huge creature that kicked once before disappearing through the half-lit pool. The right madness.